3.98% of people buy Magnetic Bottle Opener and Whiskey Rocks. "Great magnetic suction to the fridge!!" 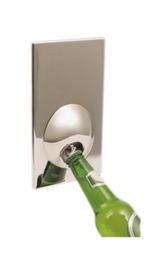 "Beer spills when you use the bottle opener"
The magnets are strong, but our fridge door is slightly curved, so the bottle opener can't sit flat against the door. The main problem though is the angle the bottle needs to be at in order to be opened means that beer spills every time. We will mount this in our outdoor BBQ area but it will not be used on the fridge due to this. Fantastic, great magnetic grip! I brought 4 as presents and everyone loved them! This handy Fridge Magnet Bottle Opener will always be there when you need it, stuck to the fridge, magnetic, stainless steel and reliable!